Located in the heart of beautiful Summit County, surrounded by lakes and mountain views out every window, Villa de Atlas, is a gorgeously appointed, perfectly situated 5 bedroom, 5 bathroom townhouse. The home is located across the street from a beautiful park with a spring fed pond and great playground. Also within walking distance to a brand new Whole Foods Market, Wal-Mart, Safeway, and Starbucks. Downtown Frisco is one mile from the house and there are miles of hike and bike trails that are accessible without ever getting into a car. The world's finest ski resorts including: Keystone, Breckenridge, Loveland and Copper Mountain are each 15 minutes away. And the World-renowned Vail, Beaver Creek, and Arapahoe Basin are located just minutes further. The Summit Stage, a free bus service serving all the local ski resorts and town, drops off just down the street from Villa de Atlas. Villa de Atlas consists of three stories. 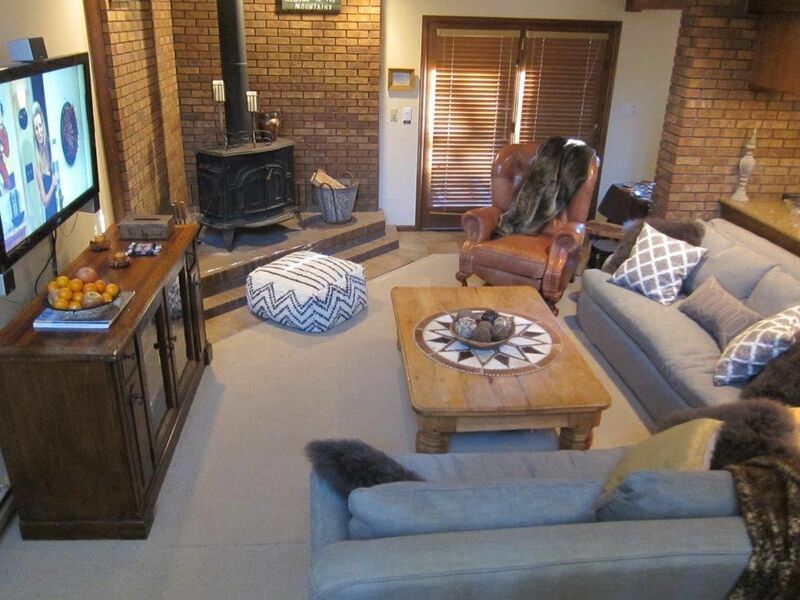 As you enter on the main living area you will feel comfortable in the rustic mountain lodge décor. The home has super Hi Speed Internet and Xfinity 200+ television stations w/ six TVs throughout. The living room has a fireplace and 65" 4K Smart TV w Sony surround sound entertainment center, Restoration Hardware Couches, and coffee table. It features an open floor plan, open to the expansive kitchen the cooks will love. The Kitchen has granite counter tops, stainless appliances, a gas cook top, and all the cooking utensils you will need; including: All Clad pans, Cutco knives, and dishes and silverware for 16 place settings. The large dining room has a farmhouse table and seating for 12 and a breakfast bar suitable for 4. French doors open off the living area to the large private deck off the back of the house with a dining table that seats 12, a gas grill, and a state of the art Hot tub with 8 seats with personal massage features and the lights change colors of the rainbow. Just replaced the washer and dryer with state of the art commercial size equipment to handle a crowd. The main floor has a private bedroom with a queen size bed, and a bathroom that has a shower. One the 2nd floor there are two beautiful masters suites, both with king size beds and televisions. One bedroom has deep soaking tub, while the other master has a shower. Both have generous sized closets and mountain views. The loft area has a desk to set up your computer and do some work away from home. Villa de Atlas is set up with high speed wireless internet throughout the house. The completely finished basement has two additional bedrooms and 2 bathrooms and a game room with a regulation size pool table, 52' HDTV, X Box One with built in Blu-Ray and DVD player, and dart board that will entertain the entire family. One of the bedrooms has a queen sized bed and a television with a private bathroom that has a jacuzzi bathtub. The other basement bedroom is a bunk room that sleeps eight comfortably. There are 4 twin sized bunk beds, one full sized bed, and one queen sized bunk bed on the bottom bunk. So 3 sets of bunk beds total. The bunk room has a private bath as well. The HEATED two car garage takes the morning chill out of getting into your car and is a great place to defrost your ski equipment while the mud room/ laundry room is set up to receive boots and coats. Villa de Atlas is comfortable home, great for entertaining, cooking, and relaxing in the hot tub after a long day of skiing or hiking the wonderland just beyond the neighborhood. This beautiful home is the perfect escape from everyday life and would serve as an ideal location for a family reunion or a relaxing weekend getaway. My name is Brian Atlas. I live in Lago Vista, Texas on Lake Travis just north of Austin. I am a developer of high end, mixed use developments in Austin, Texas. My wife, children, grand children, and myself love skiing, hiking, snow shoeing, and golf. We love Colorado as a second home. I chose to purchase this property because it is in Frisco, Colorado. Frisco is the Summit County Center. It sits in the middle between Copper Mountain, Keystone, Breckenridge, Arapahoe Basin, and Vail. Great location. It is one block from the Summit Stage Central Station, which is the free bus to all ski and shopping areas. It is two blocks from the major shopping area and across the street from a beautiful park with a heavily stocked lake. We love our home in Frisco, Colorado. Being directly on the hike and bike trails, it is convenient to walk or bike to town. The heated garage certainly takes the morning chill out of the drive to the mountains. Lots of games, puzzles, X Box 1, pool table, darts, and more. Having so many HD premium channels is great on a cold winter day. The house has 6 televisions so that everyone can watch their favorite shows. One of my favorites is the instant hot water dispenser in the kitchen! The outdoor dining area seats 12 adults as does the indoor dining table. Great for family reunions. The covered hot tub is a luxury right out the back door. Plenty of linens, towels, and two pack and plays for the babies. Super large capacity washer and dryer. Two car heated garage plus 4 additional parking places on the driveway. There is a fully heated, 2 car garage with a second full size refrigerator. Super High Speed internet throughout the house. High Speed wireless throughout the house. My home has HBO, Netflix, Showtime, Amazon Prime, and all other premium channels. High ceilings furnished with Restoration Hardware furniture. There are two full size refrigerators. A new side by side refrigeratior/ freezer in the kitchen and a full size refrigerator/ freezer in the garage. There is also a built in under counter ice maker. Gas 4 burner cook top. New double convection stainless oven. New microwave on an easy accessible shelf. coffee maker and nespresso machine. There is also a hot water dispenser for instant coffee, cocoa, oatmeal, and more. Place setting with dishes and silverware for 16. Kitchen has All Clad pots and pans, cutco knives, and spices. Full equip kitchen for cooking for large groups. The Kitchen is large and is fully equipped with every stainless appliance you can imagine with new double oven. The gas cook top and the granite counter tops make this cooking environment a dream. Farm house dining table that seats 12 inside plus 4 bar stools in the dining room with an antler chandelier. Outside is a redwood table that seats at least 12 as well. All living areas and 3 bedrooms have TVs. Televisions with cable in three of the five bedrooms along with televisions in both living areas of the home. Includes all premium channels including HBO, Showtime, Stars, Prime, Netflix, and Cinemax. Speakers inside and out on the deck. The game room in the basement has a pool table, dart board, television, Xbox, DVD player and more. X Box with numerous video games and DVDs for your enjoyment. The upper level has a loft/ office that looks out onto the main living area. 6 Bicycles including two kids bikes. There is boat rental on Lake Dillon two blocks away. There is a back deck that has a dining table that seats 12. There is also a ground mounted table that seats and additional six people. The deck is split level with the hottub on the lower level. Copper Mountain (10 minutes). Keystone (15 minutes), A Basin (20 minutes), Breckenridge (10 minutes), Vail (25 minutes), Beaver Creek (30 minutes). 4 great golf courses in Summit County. There is a set of Calaway clubs in the garage for your use as well. Great outdoor hottub with roof above. The hottub seats 7 people with an incredible light show. The stereo has speakers out at the hot tub. When you get out, there is an overhead gas heater to keep you warm while you towel off. High Speed (wireless and wired) Internet Service, six mountain bikes, outdoor dining area, wood burning fireplace, there are 5 HD televisions connected to Comcast Cable w/ all premium channels, Darts, Cooking Utensils, All Linens, Jacuzzi bathtub, Private covered outdoor Hot Tub, Heated Garage. It has two baby Pack and Plays, a battery operated baby swing, and many other baby amenities. Rarely do you find a true 5 bedroom unit that also has 5 bathrooms with showers. This unit is located two blocks off of one of Frisco's main roads, making it minutes from all the town's shopping & restaurants while providing fast easy access to Cooper, Breckenridge, & Keystone. Vail is only 30 minutes away. The dining room table was large enough to seat all 5 couples on our trip. The large fully equipped kitchen was able to accommodate several meal preparers at one time. Each bedroom was large with comfortable bedding and families with kids will appreciate the large 5th bdrm/bunk room and game room. The outdoor hot tub was large and has a heated canopy over it, making it very cozy for those colder nights. The large TV's are a bit complicated to use, but have large screens and great sound with many popular streaming apps. The garage could only accommodate one of our two rented Tahoe's, but the extra refrigerator there does hold a lot of beer! The washer and dryer looked new and both are large capacity. Overall you get a lot for the money with this unit, and owner Brian goes out of his way to make sure everything meets your expectations. I am glad that you and your guest enjoyed my home. I have to apologize in that my place was not up to par when you arrived. I don't make excuses just correct the issues and hope it did not affect your stay. Please come back sometime. Great having you and I know the skiing had to as good as it gets. Brian, thanks for the letting us rent the place. Your Hot Tub is awesome. We made some great meals with all the cooking supplies we needed. The bedrooms were spacious and comfortable. TV system is tricky, but got it to work. If you can hook up an HDMI connector to view the videos from a computer that would be great. Especially after getting 32" of snow this past weekend!!! Good location for us since we skied VAIL, Copper, Breck and A-Basin. The garage fit our Suburban, which was a bonus. No need to build a fire, your place stays warm with even having the heat turned way down...55 degrees. Thanks again and look forward to renting it again. I am glad you guys enjoyed the stay. If you had read the instructions on the wall next to the Television in the living room, you would have noticed that there is an HDMI cable on top of the audio/ video cabinet below the television for hooking up a computer or whatever. I think I will add this info to the welcome letter to insure future guest know it exist. I appreciate the feedback and hope you will visit once again. We had a great stay at Brian's home in Frisco. We ended up with 10 people and had plenty of space. The hot tub was great, and we cooked every night so we really appreciated the well-stocked kitchen with everything we needed. Short drive to Copper Mountain- would stay here again! Glad you you and your guest had a great time. Please come back again. Not a luxurious as some others I've stayed in but it gets the job done. Hot tub is amazing and fits a lot of people. Bunk beds room adds a lot of sleeping space and it's great for kids. Overall a good value for money. Thanks to Brian for providing everything some families from the Front Range could ask for for a weekend in the mountains. We had a blast, what a great house and host. Thanks! Katie and her group were great guest. I am glad they enjoyed my home. It does have everything you could ever need. It is a special place to me and my family. I take pride in ensuring my guest have a great vacation. There is very well stocked kitchen with a new double oven. Good location in Frisco, 5 minute walk to Walmart. Nice outdoor patio. Ted, I am glad you had the opportunity to spend your Thanksgiving at my home, since we could not. Yes, we just recently installed the new double oven. With a home that large we needed the additional oven for the crowd. I am sure it came in handy for Thanksgiving. Our home is well used by my family. It is well equipped since I have 3 daughters, 3 son in laws, and 6 grandchildren. We do love our home in Frisco. Glad you had a great stay. There is a $250 cleaning fee added to above rates. The tax rate is 10.1% added to above rates. Pets may be aloud if approved by owner with an additional pet deposit. I accept checks, credit cards, and wire transfers.